If you set up Mail.app in OS X to download attachments for an IMAP account, and then later decide you do not want to store a copy of each attachment locally, you can change the account settings so that only the headers are downloaded. You can make the setting in Mail.app Preferences, but, it takes a while to synchronize. Sometimes a good looong while. 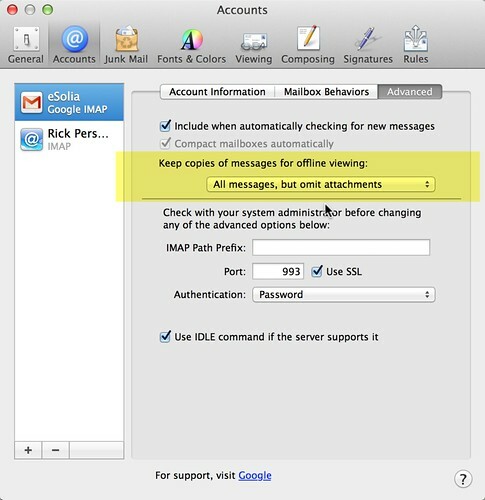 Assuming OS X 10.5.5 and that all your mail is already up on the server, first, set “Keep copies of messages for offline viewing” to “All Messages, but omit attachments” in Preferences, Accounts, Advanced. Next time you restart Mail.app, it will rebuild the folders it needs, under your IMAP folder. Warning: Don’t bone-headedly delete your email without a backup! Update 20130124: Still works in OS X Mountain Lion but the mail folders are in a V2 subdirectory, which you need to CD into.